Will Russia’s new fiscal rule end its oil and gas dependence? Russia has now emerged from recession, with deepening macroeconomic stability a contributing factor. Thanks to the Russian central bank targeting inflation, the country is enjoying its lowest inflationary environment in history: annual consumer price index inflation is currently averaging a mere 4 percent—less than a third of just a few years ago. Meanwhile, a comfortable import cover of over 16 months; high levels of international reserves (over $420 billion); and a flexible exchange-rate regime continue to help the economy navigate external shocks. Government debt to GDP is around 17 percent (the euro area’s is almost 90 percent). And by the end of 2017, both the general and federal fiscal deficits are expected to be a shade above 2 percent of GDP, and decreasing in subsequent years. It provides greater predictability to medium-term budgeting. Unlike the previous two rules, which were based on historical oil prices, a portion of the oil and gas revenue the federal government can spend in a given year will be determined by a fixed oil price benchmark ($40 per barrel in 2017 prices). Even though oil prices are somewhat high in the mid-$50s, increases in shale oil, and a move toward a greener, global future may drive oil prices permanently lower. The rule protects the National Welfare Fund (NWF) by restricting the use of oil and gas windfalls. If the balance of the NWF (at the central bank’s deposits and accounts) falls short of 5 percent of GDP, withdrawals from the NWF in the following year will be limited to 1 percent of GDP. And it is symmetrical: If actual oil prices exceed the benchmark price, the difference will be saved in the NWF. If below, the government can supplement the oil and gas revenue shortfall by withdrawing an equal, but limited, amount from the NWF. Third, the rule is simple to carry out, monitor, and communicate to the public. In the zeal for technical perfection, such important operational considerations are often overlooked. However, the question remains, can Russia’s new rule finally break its oil addiction? And is the introduction of the rule influencing market sentiment? 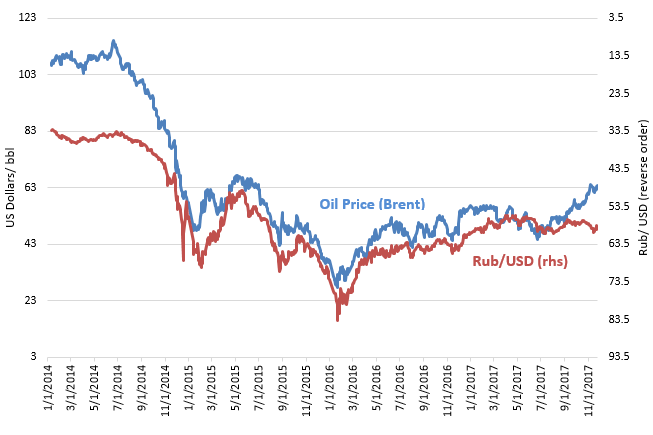 Though still early to be certain, and keeping in mind the myriad other factors that determine the value of a currency, Figure 1 suggests the Russian ruble and oil prices have started diverging since the rule became transitionally operational. Source: Central Bank of Russia & World Bank staff calculations. The rule lacks a proper escape clause. Escape clauses accommodate rare and exceptional circumstances like wars and other calamities. They are increasingly recognized as an integral part of modern fiscal rules. By allowing it to deviate from the rule temporarily, an escape clause can prevent the government from violating or exiting the fiscal rule. Indeed, in the aftermath of the global financial crisis, many fiscal rules without escape clauses were either abandoned (e.g., Chad, Ecuador, and Papua New Guinea), or modified in an ad hoc manner (e.g., Kazakhstan, Oman, and Trinidad and Tobago). Formal escape clause provisions have been newly introduced as fiscal rules in Brazil, Germany, Slovakia, and Switzerland. Even though Russia has separate budgetary provisions for unforeseen events—such as wars or catastrophic disasters—current best practice suggest codifying such circumstances and allowing for other events beyond war and disasters, such as global financial crises, in an explicit escape clause. Over time, Russia could introduce an additional provision in its rule to accumulate more fiscal savings in the NWF (Norway, with over 1 trillion dollars in its fund, has the opposite problem). With a relatively long oil and gas reserve horizon and low public debt levels, the most important policy consideration for Russia remains shielding the economy from short-term oil-price volatility. However, considering its aging population, and eventual depletion of oil and gas, building more assets in the NWF would be desirable. There is also the issue of deficits resulting from other factors, for example, overly optimistic projection of non-oil and gas revenue or large swings in the exchange rate. These would then need to be closed by borrowing or reducing expenditure; however, these are not imminent issues as Russia currently has sufficient borrowing headroom and a discretionary expenditure mechanism. But it is important to remember that no one-size-fits-all fiscal rule can address all policy concerns, or cover other weaknesses in the economy that keep Russia’s productivity low and declining. Ultimately, successful macroeconomic stabilization depends on complementary policies and political commitment. If that holds, for Russia’s new fiscal rule, the third time may well be the charm!